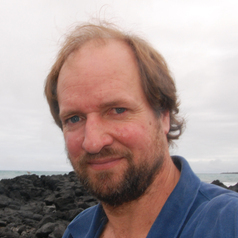 Professor Graham Edgar is a marine ecologist at the University of Tasmania. He is well known for his writing for the wider public. His book Australian Marine Life is highly valued and much used by temperate marine biologists. It was awarded the Whitley Award by the Royal Zoological Society of NSW in1997, and a companion volume on ecology, Australian Marine Habitats, also received a Whitley Award in 2001. The knowledge contributing to these books is deep and extensive, and many years in the making. Additional to these books, his >100 journal publications are widely recognised and highly cited in the scientific literature. He was the recipient of a Fulbright Tasmania Scholarship in 2010. This scholarship is sponsored by the Tasmanian government and the University of Tasmania and is awarded to an applicant to undertake research in the United States on a topic or issue of importance to the state. Through his Fulbright, Graham researched the effectiveness of marine protected areas as a tool for biodiversity conservation at the Centre for Applied Biodiversity Science, Conservation International in Arlington, Virginia. Graham has a PhD and an honours degree in marine biology from the University of Tasmania, and a BSc from the University of Sydney. He is President of Reef Life Survey Foundation, a charitable NGO that aims to improve biodiversity conservation and the sustainable management of marine resources by coordinating surveys of rocky and coral reefs using scientific methods, with the ultimate goal to improve coastal stewardship.